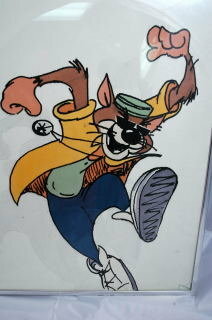 MC Skat Kat was an animated cat who appeared with Paula Abdul in the video for her song "Opposites Attract" in 1989. MC Skat Kat was created by Michael Patterson . This is an original pen/ink painting that has been cut out and mounted on paper askew slightly from the "shadow". Later on the animated character has appeared in production with Rapper, singer and actor Tone Loc as well as other stars. The artwork offered alone is quite a rarity. 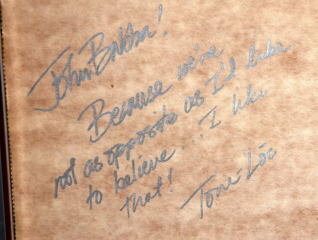 However the other fabulous feature is that the back is signed by Tone Loc with a dedication to a John Babba. ( I am not certain of the last name). It says " Because we're not as opposite as I like to believe ....I like that!". I have done some research and I cannot find any reference to a John Babba. Perhaps it is nickname. 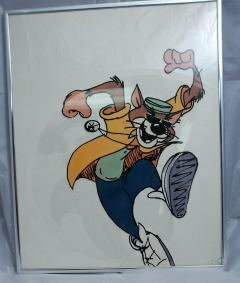 The condition of the art is excellent and comes a 21 " x 16" silver metal frame. The glass has a small break in the lower right hand corner. I can mail it to you with or without the glass. For now I am going to leave it framed behind the glass to protect the art. Combine purchases and save money on shipping. Please email me if you have any questions. I am always eager to assist. I offer a short term LAY-A-WAY on certain fixed priced items. 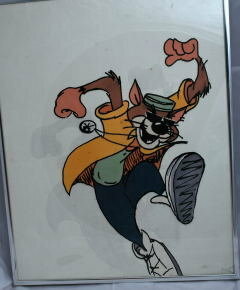 Items Similar To "Animated Art MC Skat Kat Tone Loc Dedication & Autograph orig a..."